My first book, Circling started its journey to some where (we’ll hold off on that discussion). Book Two finally earned a name! Forever Falling has been resting comfortably at 36,000 words, while Circling got a last push out into the great unknown. This week Forever Falling will take center stage and be moved to the veritable front burner. I am very excited! As I mentioned a few weeks ago in the post When Is The Forgivable, Unforgivable, my mind has been on villains a lot these last weeks. In Forever Falling, the lines between doing what is right and what is wrong, but for the right reasons, becomes blurry. Forgiveness is the key here, but it has to be balanced with self-preservation. A few nights ago, with the encouragement of my Twitter writer companions Nate Philbrick (@Flashfloord14, flashfloodfiction.com) and Susan Kicklighter (@writing 4kix, writing4kix.tumblr.com), I signed up for a Pottermore account to let the sorting hat do its job. This is the part there non-Harry Potter fans hit the back arrow and move on – no offense taken – have a lovely day. So – I signed up at Pottermore and followed the required sequence that allowed me into the Great Hall at Hogwarts to participate in the sorting ceremony. I took this seriously, my friends. I could have manipulated that test any way I wanted (a lesser talent of mine), but I was truthful and it was a hard test. I had concerns. I am fairly sure there aren’t many Leos in Hufflepuff or Ravenclaw. I figured I had a decent shot at Gryffindor. But I have a dark side that requires constant management. Again – I had real concerns. The questions were not obvious. It wasn’t… Would you remain faithful to the Dark Lord after years of absence? Are you a Death Eater? Would you date Draco Malfoy? It was more about your thought process. After the horror passed and my family fell out of their chairs laughing at the obvious, I did a little research about Slytherin beyond Salazar, Tom Riddle, Malfoys, Lestranges, etc. Here is what I learned: Merlin was Slytherin. Traits = cunning, ambition, likelihood to look after their own (loyalty? ), play to win mentality, powerful, oft misunderstood, keen instinct for self preservation. 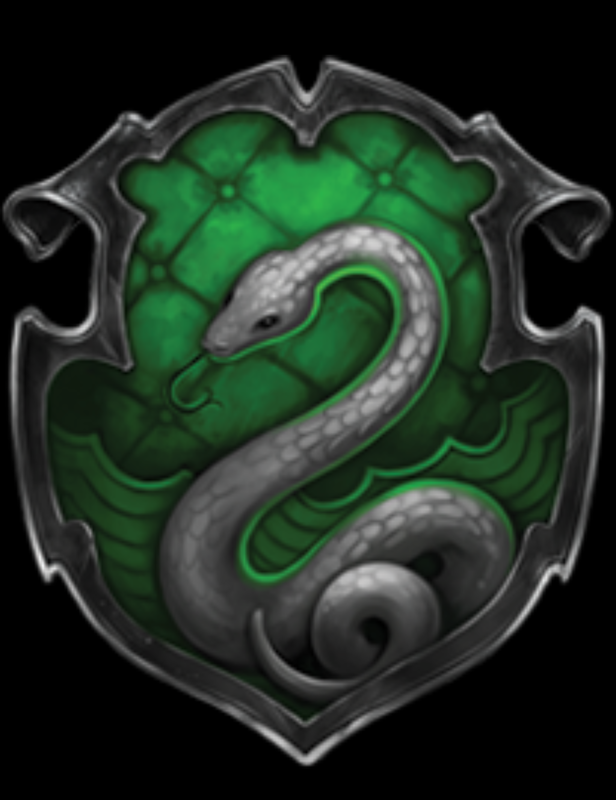 Bottom line, I have to own it, I am Slytherin. I am the sweet writer sitting next to you at Starbucks, but screw with my people, zombies take over the world, danger knocks at my door… I will handle it. Which takes me back to the beginning. Villains. This unexpected Slytherin twist is giving me much more to think about. When I started asking questions about villains, I didn’t realize the villain was possibly me. Now I know more than ever, understanding villains is about understanding the capacity for dark works that lives within us all.